Thematic research group: Mr Pollard is a member of the Biogeography and Biogeomorphology group. Researching patterns and processes of large-scale coastal behaviour. Focusing on the North Norfolk coast this work seeks to better understand the interaction between coastal erosion and flooding hazard and the consequent risks for inland communities and ecosystems. 2016 - present: PhD 'Temporal and spatial patterns of shoreline change and exposure of coastal communities and ecosystems to future flood risks'. NERC funded through DREAM CDT (Data, Risk, and Environmental Analytical Methods). Undergraduate dissertation: 'Characterising risk perceptions surrounding hydraulic fracturing operations in New Zealand'. Later published in ​Risk Analysis (https://onlinelibrary.wiley.com/doi/10.1111/risa.13167). At any one time, and in any one place, the morphology of the coast reflects the interaction of marine, terrestrial, climatic and anthropogenic forcing factors. The complexity that results makes it difficult to abstract general rules to explain coastal change and demands instead, detailed longitudinal studies with explicit attention to local setting. My current research makes use of historical maps, aerial photography and various remotely sensed datasets to provide a detailed account of morphological change at the coast over the past 120 years. In seeking a process-based understanding for the changes observed, the relative importance of extreme events versus continuous forcing is a central line of investigation. The insights gained through this study of historic shoreline change along the North Norfolk coast possess inherent relevance to coastal risk management. Previous research by the Cambridge Coastal Research Unit has established that storm surge impacts display considerable alongshore variation which can be attributed to the effect of local setting. This means that it is important to consider both the coastal setting (eg: open or sheltered) and environment (eg: saltmarsh, sand dune or tidal flat) when modelling surge propagation from its offshore source to coastal communities at risk. Current approaches to modelling surge risk typically omit rigorous analyses of future shoreline position and morphology, representing a gap in our knowledge that this research seeks to address. The North Norfolk Coast provides an appropriate study site for this research given the long period of scientific study including detailed records of extreme events and habitat response to this exposure. This coast is host to an array of nationally and internationally protected areas, alongside AONB and Heritage Coast designations. Future changes in these environments are therefore of great importance, not least to those communities and businesses dependant on this coast for commerce and leisure. 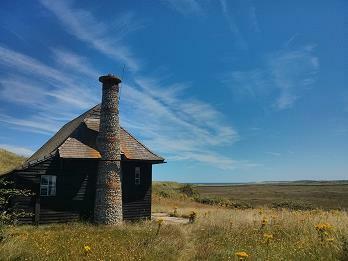 Image: The Hut, Scolt Head Island, North Norfolk Coast. James Pollard, 2016. Pollard, J. A., Brooks, S. M., and Spencer, T. (2018) Informing decision making: erosion and flood risk on the North norfolk Coast. Oral presentation, Talking Flooding, Birkbeck University, London. Pollard, J. A. (2018) Mapping coastal flood risk in the world's most vulnerable cities. Oral presentation, Future Cities Conference, 2018, Cambridge. Pollard, J. A., ​Brooks, S. M., Spencer, T., and Möller, I. (2018) Geomorphic Risk: investigating the relationship between geomorphology, erosion and flooding at the coast. PICO, European Geosciences Union 2018, Vienna. Pollard, J. A. (2018) Using Big Data to investigate the relationship between erosion and flood risk at the coast. Oral presentation, Jesus College Graduate Conference, 2018, Cambridge. Pollard, J. A., Spencer, T., and Möller, I. (2017). Temporal and spatial patterns of shoreline change and implications for risk management in North Norfolk. Poster, Young Coastal Scientists and Engineers Conference, 2017, Bath. Pollard, J. A. (2017) Emphasising shoreline morphology in the source-pathway-receptor approach to coastal risk management. Presentation, Data, Risk, and Environmental Analytic Methods (DREAM) Symposium 2017, Cambridge. Supervisor: Geographical Tripos Part 1A, The Earth, The Cryosphere & Oceans, Coasts and Catchments. Supervisor: Geographical Tripos Part 1B, Coastal Hazards. Technical Guidance: Several third year dissertation students studying shoreline change in sandy systems. Demonstrator: Geographical Tripos Part II, Muddy Coasts and Estuaries.